Human nervous system. 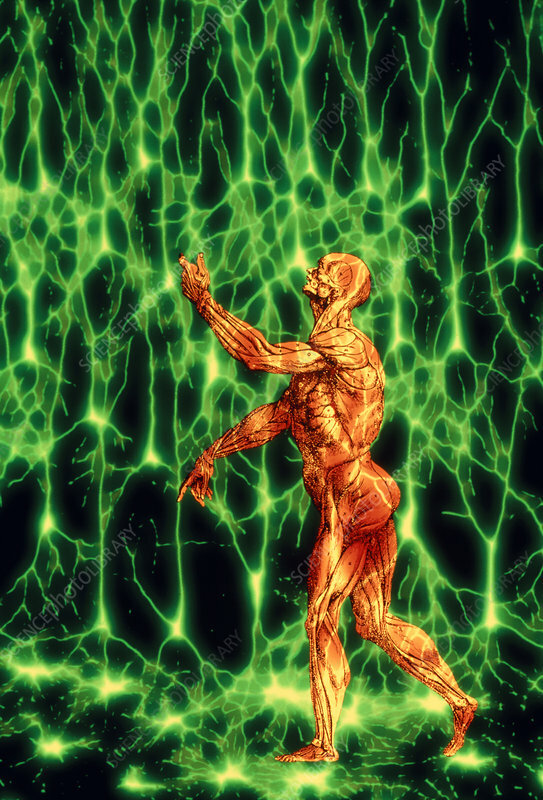 Composite artwork depicting the human nervous system showing a human anatomi- cal figure against a background of nerve cells. The image of nerve cells (neurones) from the brain cerebral cortex is based on a fluorescence light micrograph. The cells here are mainly pyramidal nerve cells (triangular shape) with dendrites and axon nerve fibres leading off them which transmit nerve impulses. At lower frame are astrocytes, non-conducting star-shaped cells which supply nerve cells with nutrients and may store nerve information. The drawing of the human muscle system is by Andreas Vesalius from his book: De Humani Corporis Fabrica (1543).